“Winter camping is a really unique and different experience. 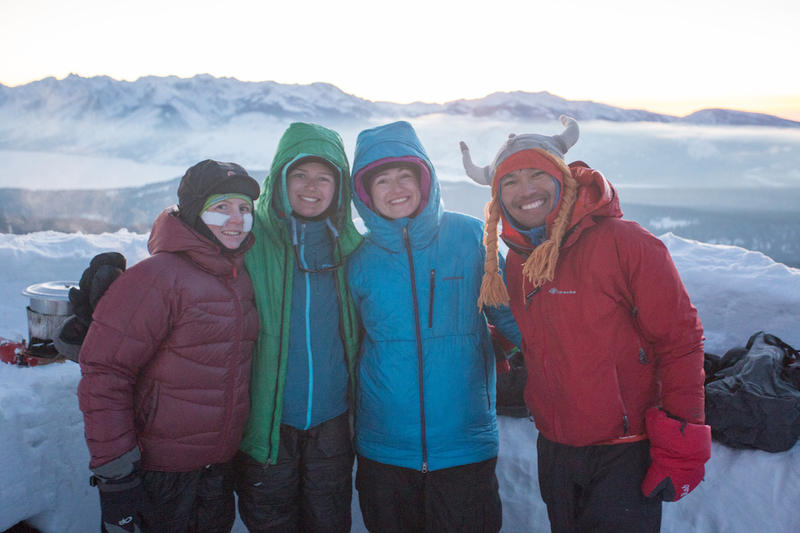 Only a small portion of people go expedition-style winter camping the way NOLS does,” explains Katie Oram, a veteran NOLS instructor. Because of this, Katie's offered her expertise to share everything she knows about winter camping—and we mean everything, from how to set up camp to special tips for cooking in winter. 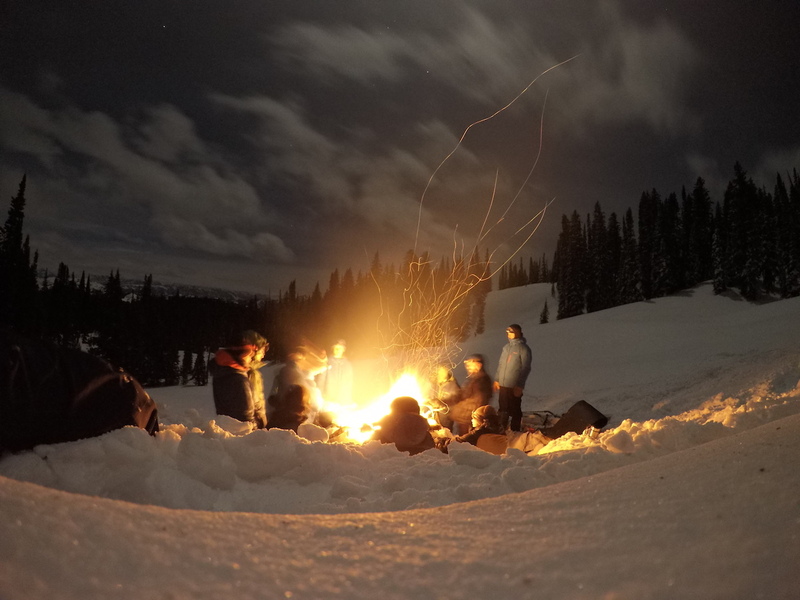 If you're looking for a comprehensive guide to winter camping, read on. Many backcountry climbing, hiking and skiing objectives can’t be reached in one day. 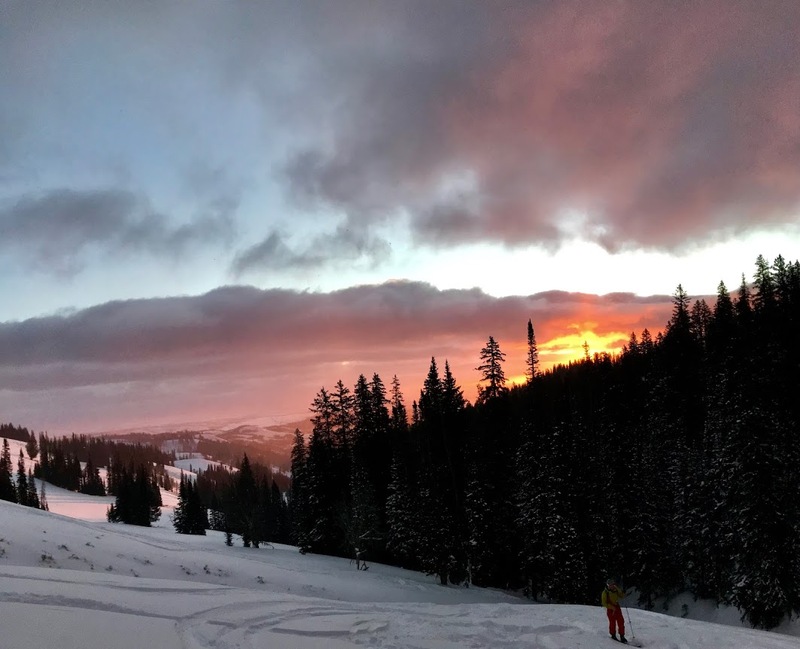 For many skiers and snowboarders, finding untracked powder may be a rare treat, and winter camping makes this the norm. Being eaten alive—whether it’s by bugs or most other animals—isn’t a concern. This makes campsite set up slightly easier, since you don’t have to establish a bear triangle. There are several methods of mobility in the winter, and your best option will depend on the conditions, your budget, and your skill level. Walking in hiking boots will be your simplest option. Hiking is great if you plan to stay on a trail that sees heavy traffic and is already packed down. Boots ideally will be waterproof, high cut, and insulated. You can also add micro-spikes for additional grip in icy conditions. In potentially steeper or deeper snow conditions, snowshoes are a relatively inexpensive option to expand beyond hiking trails into different terrain. The main advantage is that they let you stay on top of the snow better than boots so you can avoid post holing. It can be awkward to walk in them at first, but doesn't require any special skill or training to learn, plus it's a great way to expand from hiking trails to different terrain. 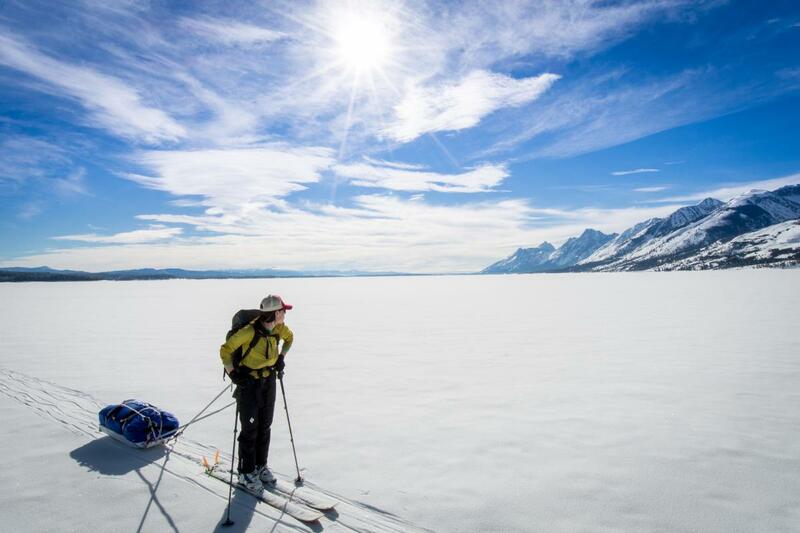 Ski touring and splitboarding (backcountry snowboarding) can be incredibly fun and efficient ways to explore off-trail in the snow, but this mode of travel requires specialized skills and specialized equipment. 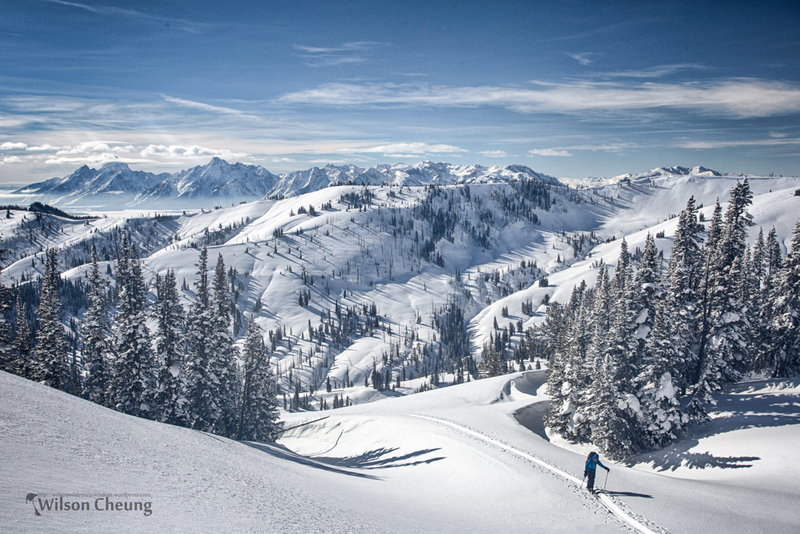 Grippy climbing skins are attached to your skis or splitboard, and special bindings allow you to raise your heels and ascend relatively steep slopes. Then, when you reach the top of the hill, you remove the climbing skins, adjust your ski boot or your splitboard setup, and head downhill. 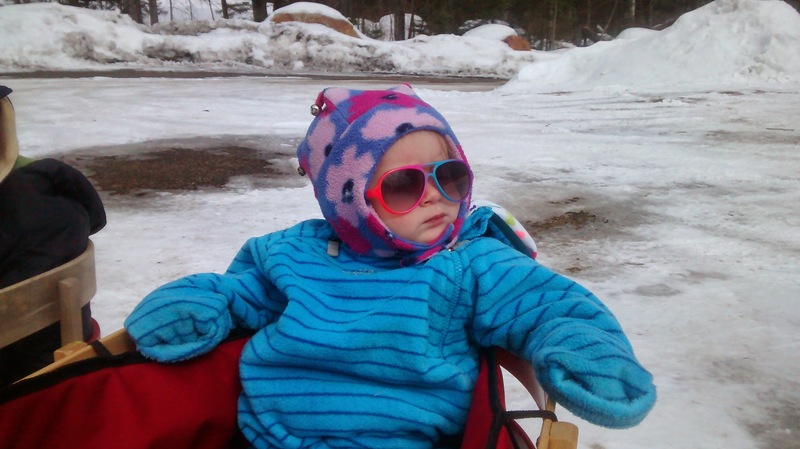 Staying warm is the name of the game while winter camping. The elements are working against you, and it takes discipline to stay ahead of the cold. With so much variation from individual to individual, it can be tricky to dial in layering. What may leave one person comfortable could leave another too sweaty—which can spell disaster in the winter. It’s important to dress like an onion to trap body heat between layers. Generally, start with a quick drying, moisture-wicking base layer to help pull sweat away from your body and help with thermoregulation. This layer should be slightly fitted, as to make contact with your skin and actually wick away moisture. Cotton should always be avoided in cold temperatures, as it absorbs moisture, loses its insulating qualities, and won’t dry quickly. Nylon and polyester are common choices, and their ability to wick moisture will depend on the weave and quality of fabric. Merino wool is also a good option, but can be expensive and less durable than synthetic materials. The next layer of the onion is a mid-layer, such as a light fleece or small puffy jacket. If you’re doing vigorous physical activity during the day in good weather conditions, this may also be your outer layer. Depending on weather, your outer layer will either be a waterproof shell or insulated puffy jacket to trap heat and protect you from wind and precipitation. Your shelter can make or break your winter camping experience. Less daylight and snow storms can lead to long periods of time inside. 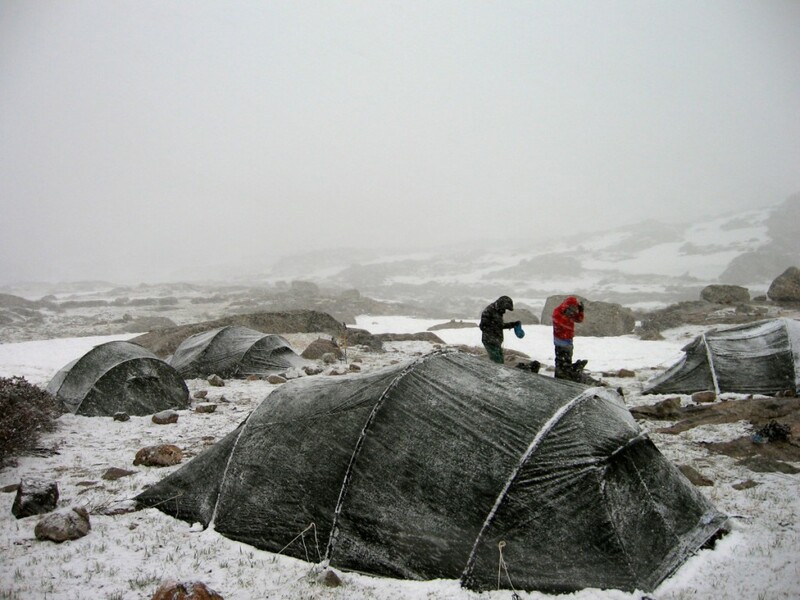 4-season tents are specially designed for winter conditions. Made with heavy duty materials, strong poles, and thick walls, they can withstand strong winds and snow accumulation. Walls typically lack many ventilation options in order to trap body heat. A large vestibule is a nice addition to store gear. 3-season tents are typically lighter and have plenty of options for ventilation such as flaps or mesh walls. The walls will be thinner than a 4-season tent. They aren’t designed for winter conditions, but can work well in milder winter weather. Building a snow shelter can be a viable option for a winter camper. They are time consuming to build, so Katie typically only builds them if she plans on staying at one campsite for a number of days. Your campsite will be your one refuge from bitter cold winter conditions, and your life will be much easier if you take the time to pack down tent areas and build high snow walls to protect your shelter from high winds. You won’t be able to pound stakes into dirt, but you can secure your tent using buried stuff sacks, small sticks, or other camp items you aren't using. For kitchen sites, group kitchens tend to work well. 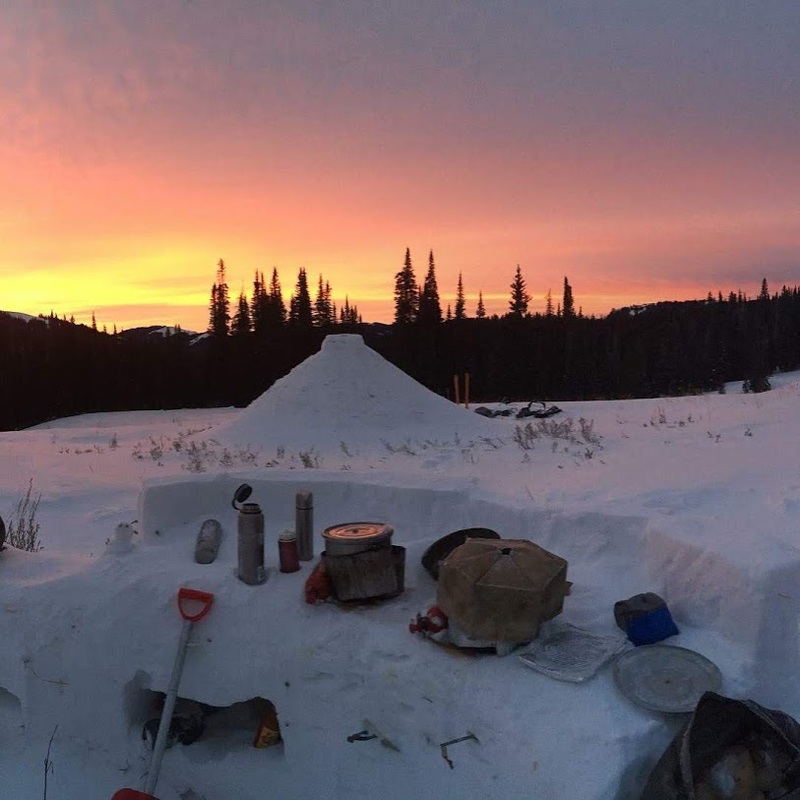 NOLS students build them on courses by mounding up a big area of snow, letting it sit for an hour or so, then diggging out a long rectangular mound. After that, you can shovel out countertops or dig personal, in-cut "shelves" into the mound. In order to avoid cross contamination with food or human waste, designate a snow collection area where people only go to get fresh snow for water. Picking the correct shelter is only half the battle. What will you need stay warm when you’re sleeping in your tent, especially if your clothing gets damp during the day from sweat or snow? Down or synthetic sleeping bags are fine, though it's important to be aware that down bags won't insulate if they get wet. Because of that, they require careful care with packing. For Katie, she recommends using two sleeping bags: “I’ll usually put a smaller 10-degree down bag inside a 0-degree synthetic bag that is a little longer. That system is really warm, and then you can dry clothes between the two bags. Plus, you can probably use sleeping bags you already have (or can borrow), versus needing to buy one really warm sleeping bag that you only use in the winter." If you bring two pads, we recommend using an inflatable pad on top of a foam pad. On a normal winter day you’re probably burning 4000-5000 calories. You'll need to snack pretty frequently to stay on top of the calories you're burning—plus, consuming calories helps your body stay warm. On top of that, planning and cooking good, solid meals will help you stay warm and be a big morale booster! All the water you consume will have to be melted from snow. Moist food will turn into solid block if you aren’t careful. Even though they are bulkier and more time consuming to set up, white gas stoves are preferred. Propane and isobutane canister stoves simply don’t work well in freezing temperatures. So, what do to? Calculate how much fuel to pack (likely more than you'd need for a trip in warm weather) and be careful about which food you pack (dried items like pasta, or freezing burritos ahead of time to thaw later, are great options). 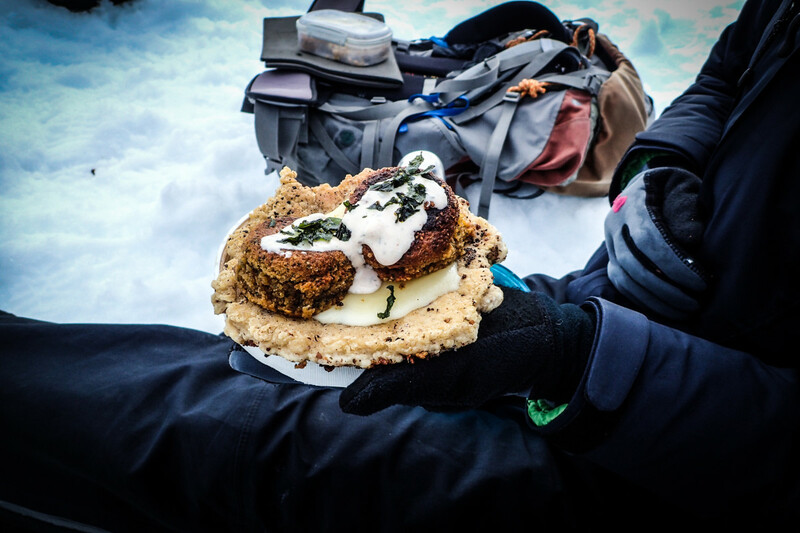 For NOLS winter courses, we bring 2 Whisperlite stoves per 2-4 person cooking group and pack ½ liter of white gas per stove, per day. Then we bring extra, because no one wants to run out of fuel in the winter. "If you bring two stoves, you can dedicate one pot to making hot water, and the other stove to cooking the meal,” says Katie. Before going to bed, Katie recommends melting water, then storing it in a square of snow cut out from the snow kitchen counter. Snow makes a great insulator, so the water won't freeze overnight. That way, you'll have water ready to go for hot coffee in the morning. At the same time, she says "It’s important to have a really clean kitchen, to pack out all the trash and food scraps” since it’s so easy to lose things in the snow. From a Leave No Trace perspective, all deep snow is considered a durable surface. Pooping in the snow is acceptable, unless special regulations state otherwise. 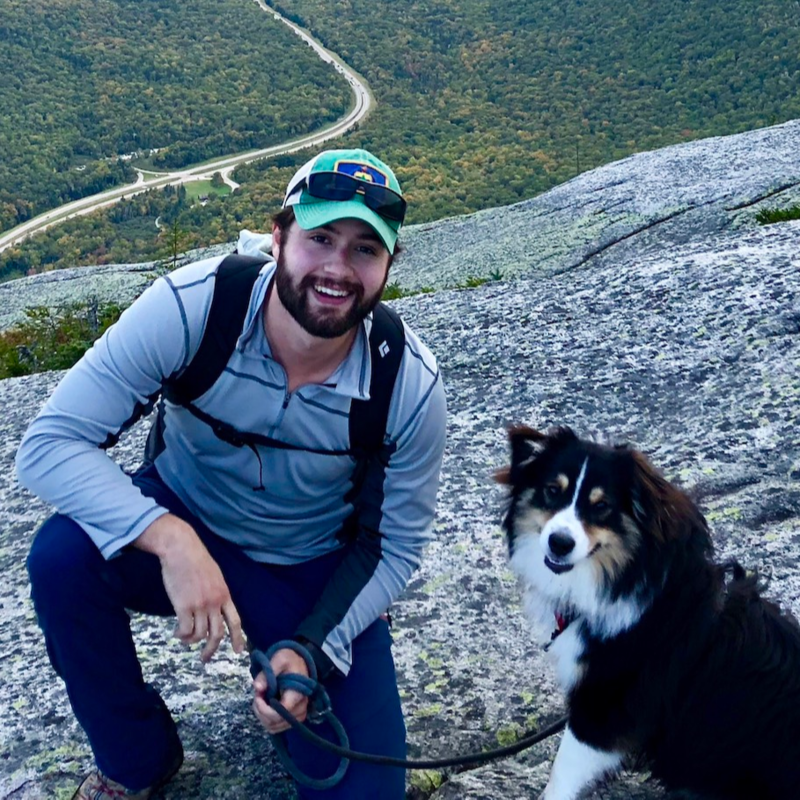 Katie recommends designating large bathroom areas, and digging a deep hole with a ski pole—it’s better for decomposition if you don’t poop in the same exact spot every time. You’ll friends will also appreciate if you mark where you’ve already gone to avoid digging up unwanted buried treasures. Hypothermia and frostbite are the primary concerns in any cold-weather environment. For these, as with any medical concern, prevention is key, which you can do by staying warm and acting before you start to feel cold. There is a variety of miscellaneous gear that will make life easier in the backcountry. Insulated water bottles: while heavier than a traditional plastic container, these will prevent your water from turning into a frozen block. Drinking hot beverages is also a significant morale booster, and will help warm you up. Camp shovels: helpful for digging out your camp, building a kitchen, or preventing your shelter from getting buried in a snowstorm. Adventurers who brave the frigid temperatures to go camping in the winter months are lifelong learners. You can always make slight adjustments to your systems to increase comfort and safety. Ultimately, proficiency will come from lots of fine tuning, and trial and error. Go face the cold, and come out with a new set of skills and stories! 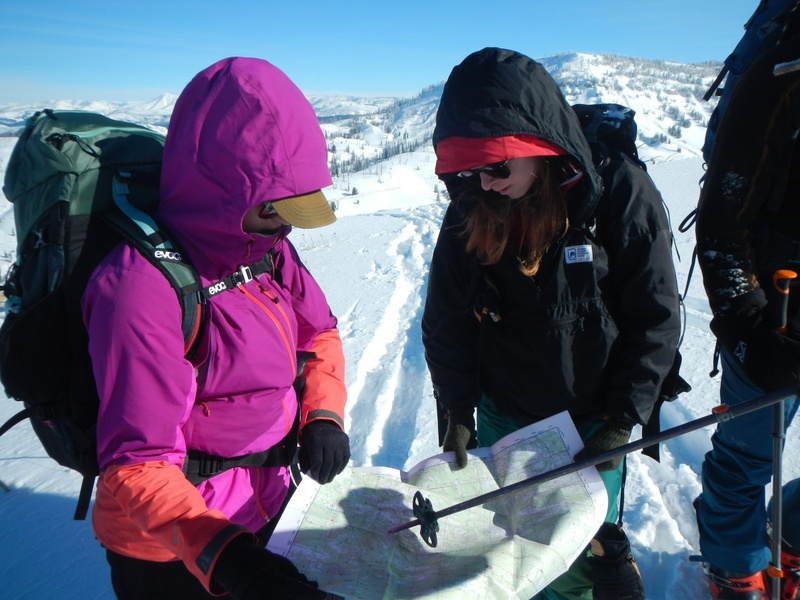 Learn to winter camp on a NOLS backcountry skiing or splitboarding course.